Hammertone aluminum sheet is also known as hammer aluminum sheet, hammered aluminum sheet, which is widely used in decoration, insulation and lighting industry. The aluminum alloy of hammertone aluminum sheet coil are 1060, 1100, 3003, 5052 and so on. 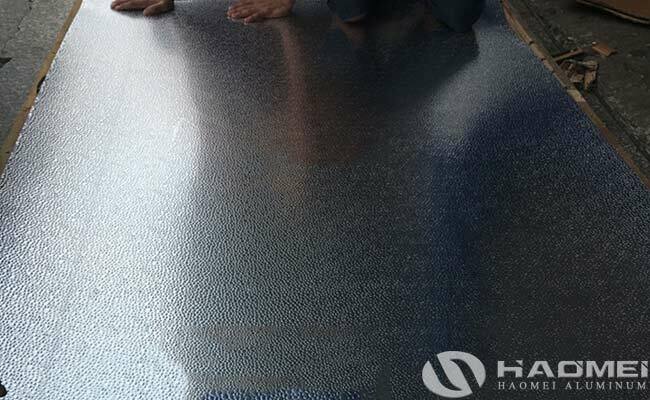 The pattern on the surface of hammered aluminum is beautiful, which is also very important while applied. The thickness of hammer aluminum sheet is 0.8-10mm, the width is 800-1220mm, the surface treatment can be mill finish or mirror finish. Professional hammertone aluminum sheet supplier can produce high quality hammer aluminum which surface is clean and shiny, oxidation can remove residual oil and manually carry fingerprints on the surface. Hammered aluminum sheet is widely used in refrigerators, cold storage, refrigerators, solar thermal reflectors, decorative aluminum products, lamps, luggage, sterilization boxes, air conditioning ventilation pipes, interior and exterior decoration, mechanical equipment shell and other industries. After hammertone embossing, it can enhance the thickness and strength of the hammered aluminum plate. The thickness of the base aluminum sheet can be 0.15mm–1.5mm, after hammered embossing, the aluminum plate can be thickened by 0.1mm–0.25mm, the size of hammertone aluminum sheet can be produced according to customer requirements.